Academics from many disciplines have studied the elusive concept of power. Hokanson Hawks (1991) provided two different meanings for power: (1) power to, or the ability to get things done, and (2) power over, or the ability to influence the behaviour or decisions of others. The definition of power, commonly found in leadership research, is “the ability to get things done, to mobilize resources, to get and use whatever it is that a person needs for the goals he or she is attempting to meet” (Kanter, 1993, p. 166). Power is a force that is inherent and personal and it comes into play when clinicians are influencing the health care decision making of others (Milton, 2016). When power is defined as the ability to get things done, it is a significant resource for nurses, and as such, warrants further in-depth discussion. Sullivan (2013) adapted the classical description of social power to fit the nursing perspective. The five types of nursing social power, as described by MacPhee (2015) are: (1) “personal power based on one’s reputation and credibility; (2) expert power [referring to the possession of skills and knowledge] that are needed by others” (p. 188); (3) position power that is a result of your position in the organization or group; (4) perceived power resulting from your status as a powerful person; and (5) connection power ensuing from your association with, or links to, powerful people. Understanding these versions of social power, which have been adapted for nursing, will provide the nurse leader with a basic understanding of the power dynamics that influence decision making within the workplace. Read the following article to learn more about power, then answer the following questions. What are three assumptions that the rationalist/positivist makes about power? What are the limitations of studying power from the rationalist/positivist approach? What is the main assumption about power in using the complex responsive process analysis? Why should we examine and call attention to patterns of power relations within organizations? Recognition of the impact of colonization and residential schools on the health and well-being of Indigenous people requires the nurse leader to take a closer look at the relationship between power and diverse populations and, more specifically, at the relationship between power and the Indigenous population. Foucault’s work demands that we acknowledge “how power relations shape the production of truth” (Macias, 2015, p. 225) and how “discourse defines and limits the subject’s freedom” (p. 231). Foucault also suggests that changing discourse can produce freedom. Changes in ownership of Indigenous health and well-being are rapidly becoming evident in the relationship between Health Canada and the Indigenous population. In accordance with the wishes of the Canadian Indigenous people for a health plan that meets their needs, the Government of Canada developed the First Nations and Inuit Home and Community Care (FNIHCC) 10-Year Plan (2013–2023) (Health Canada, 2015).This plan provides a template for collaboration with First Nations and Inuit partners in health care. It will be updated yearly or as needed. The plan is envisioned as responsive to the unique needs of the Indigenous people, representing “a continuum of home and community care services that are comprehensive, culturally safe, accessible, effective, and equitable to that of other Canadians and which respond to the unique health and social needs of First Nations and Inuit” (Health Canada, 2015, p. 1). [January 1958], photo courtesy of the Provincial Archives of Saskatchewan, Photographic Services Branch Collection, collection number R-B6805, is used with permission. All rights reserved. 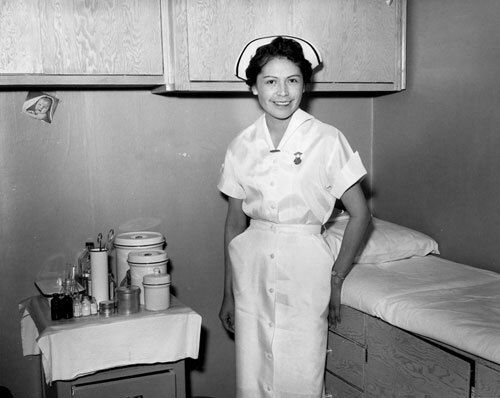 About this photo: Jean (Cuthand) Goodwill was the first Indigenous nurse in Northern Saskatchewan. This photo was taken at the Indian Health Nursing Station in La Ronge, Saskatchewan. Jean Goodwill and her colleague Jocelyn Bruyere went on to develop a registry of Indigenous nurses, which eventually became the Registered Nurses of Canadian Indian Ancestry, laying the foundation for the formation of the Canadian Indigenous Nurses Association in 1975.